I’ve mentioned before that I was super excited to finally visit Versailles this past June. 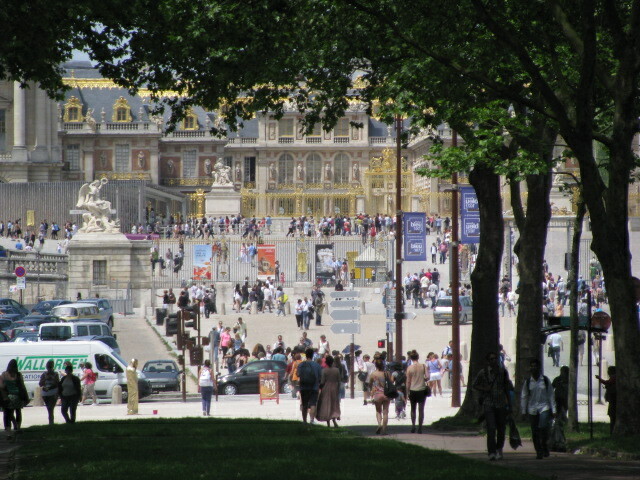 This was my first glimpse of the palace … and all of the people! This entry was posted in Travel Photos and tagged 50 Year Project, Europe, France, French History, French Landmarks, Historical Places, Paris, Photography, Tourists, Travel, Travel Blog, Travel Journal, Travel Photo, Versailles. Bookmark the permalink. Wow, that is a lot of people! Hope you post more of your photos from there. Glad you were able to visit Versailles! It’s quite a place! Very interesting photo. Dark tree in the front and the rest in the sun! I always seek out shade. You are right about the people. I went there three times – and each time it was crowded! That is a lot of people! Can’t wait to travel. You always make me so jelous! I bet it’s difficult to get a photo of it without so many people. I’ve noticed that with many European cities.